Who was the chicken that crossed the road — in Portlandia? Make fun of them all you want, but the folks down in Portland know how to eat. If I had to move anywhere, it would be there, where you might find me standing in line at Tasty n Sons waiting for one of the best brunches I’ve eaten anywhere. And yes, I’d likely know exactly where my food came from. Tasty! 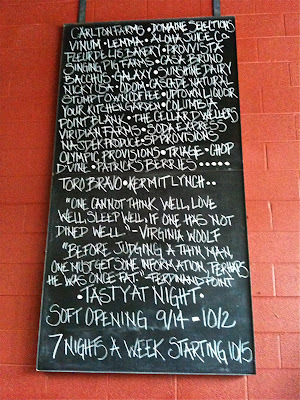 — the provisioners list at Tasty n Sons. So, I’ve got to ask: If some cheeky TV comic decided to poke fun at the Seattle food scene, what do you think they’d they’d bust us for? Here’s my take: I’d get a kick out of hearing a hilarious conversation among strangers seated at one of Seattle’s many communal tables. Or maybe a laughing look at a local coffee shop: one housing latte-art-sipping patrons staring into their laptops “talking” to their “Friends” while saying exactly nothing to the scores of coffeehouse clientele seated around them.